Well, here I go on my new commitment to be a better blogger. I'm actually very excited about it! Here goes! So, to commemorate the first day of the new year, I decided to make a fun paper craft. I think it's pretty cute! 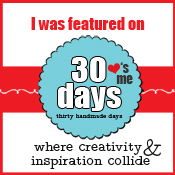 The super groovy part was that it was made with all my old supplies... love that! 1. 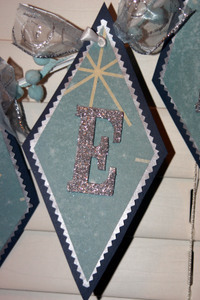 Using a great patterned paper, cut out 7 diamonds. My paper was Gin-X by Imagination Project. My diamonds were 7 inches tall by 3 1/2 inches wide. 2. 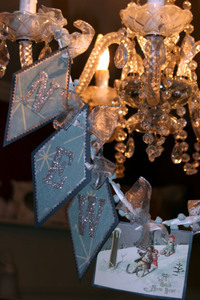 Back the diamonds with silver paper by Paper Adventures and trim the sides with pinking scissors. 3. Then back those two layers with a dark blue cardstock. I finished the back of my navy blue diamonds with a light blue glitter. 4. 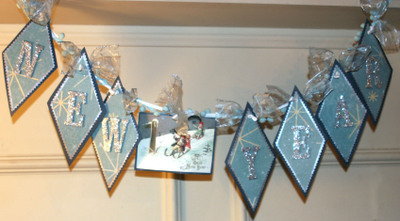 Using Glue Dots, stick the Twinkle Type Letters to the diamonds. 5. Punch a small hole through the top of the diamonds. 6. Print out a vintage image on cardstock and back with dark blue cardstock. I also applied glitter to the back of this and punched a hole in it. 7. I then strung the diamonds and vintage image onto a length of ribbon and tied knots over each diamond to anchor them in place. 8. I then took about 2 yards of ball trim and wrapped it along the length of the garland. 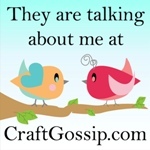 Super easy and a fun project too! 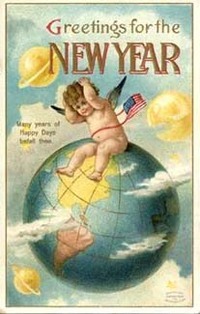 Below I've included some of my fav New Years images for you to use... have fun! I can't wait to do one of these for each holiday! 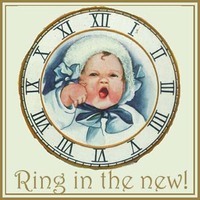 Hope that your 2007 is full of fun, happiness & success!! Your garland is just beautiful!